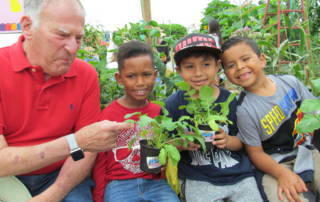 Del Mar, CA … Plant the seeds for a lifetime appreciation of farm-fresh healthy nutrition by donating to Don Diego Scholarship Foundation’s Plant*Grow*Eat (PGE) transportation program. 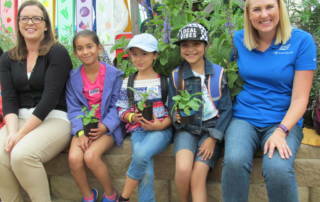 You’ll get free publicity, VIP parking and admission to the 2019 San Diego County Fair on “your” day plus the delight of sharing an exciting growth experience with eager elementary students. To advance the Fair’s PGE agricultural education program, Don Diego sponsors buses that bring students from Title I schools to the Fair’s Infield Farm. 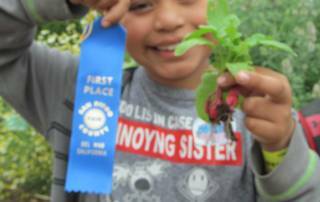 They showcase their carefully nurtured produce, receive a ribbon for their efforts, then scamper off to explore farm exhibits and even pet an animal or two! Scholarships are offered in six categories. Individual awards range from $1,000 to $5,000. The deadline to apply is March 18, 2019. Eligibility details and applications are at dondiego.staging.wpengine.com. For questions, contact cmannen@sdfair.com. Del Mar, CA… The Don Diego Scholarship Foundation believes future leaders are worth a million! 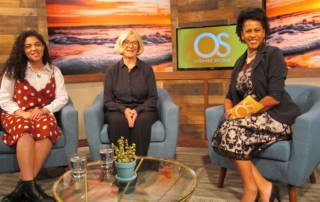 To date, the Foundation has awarded nearly one million dollars in college scholarships to outstanding students throughout the San Diego area who have excelled in academics, given back to their community and participated in the San Diego County Fair and/or other activities associated with the Del Mar Fairgrounds. 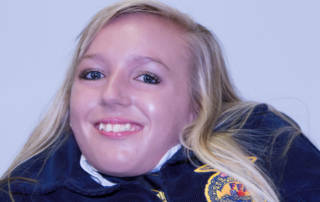 Qualifying high school seniors may have participated in an organization such as FFA or 4-H; showing or auctioning animals at the Fair. Students also are eligible if they have worked at the Fair or Fairgrounds, or exhibited or performed at the Fair. The highly competitive, annual application process begins in January. Recipients are selected in the spring and feted at a summer Gala. Scholarships support students pursing a Bachelor’s Degree as well as an AA Degree or related vocational certificate. Eligibility guidelines are at dondiego.staging.wpengine.com/scholarships. Achievements of Don Diego Scholars are at facebook.com/dondiegoscholarship. 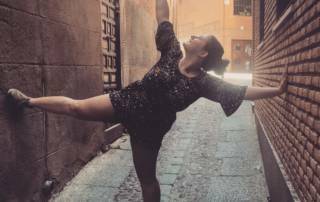 Some, such as 2014 top recipient Carolyn Kravitz, who graduated from Stanford this spring and is now pursuing a PhD at Yale, are ambitiously embarking on advanced degrees and exciting careers. A 2017 scholarship took Jessica Xu to MIT. She spent Summer 2018 in Singapore through a undergraduate research fellowship, in which she worked on streamlining a microfluidics method to analyze cancer cell clusters. Del Mar, CA… The Don Diego Scholarship Foundation believes future leaders are worth a million! To date, we’ve awarded nearly one million dollars in college scholarships to outstanding students throughout the San Diego area who have excelled in academics, given back to their community and participated in the San Diego County Fair and/or other activities associated with the Del Mar Fairgrounds. Qualifying high school seniors may have participated in an organization such as FFA or 4-H; showing or auctioning animals at the Fair. Students also are eligible if they have worked at the Fair or Fairgrounds, or if they’ve exhibited or performed at the Fair. The highly competitive, annual Don Diego application process begins each January. Recipients are selected in the spring and feted at an annual Gala in the summer. Scholarships support students pursing a Bachelor’s Degree as well as an AA Degree or related vocational certificate. Eligibility guidelines are online now. We encourage high school seniors to ascertain their eligibility and urge juniors to get involved in an activity that qualifies them for scholarships ranging from $1,000-$10,000. Be prepared – do it now! Over the years, several Vista High students have earned Don Diego scholarships. These include 2015 recipient Amy Wehner and 2016’s top $10,000 winner, Yessica Vargas. Victoria Navarro, a 2018 Panther grad, is currently a first-generation college student on track to attain a degree in Psychology, supported by a Don Diego scholarship. WHERE MIGHT A DON DIEGO SCHOLARSHIP TAKE YOU? Del Mar, CA… This fall, 30 outstanding students from around San Diego County are embarking on ambitious educational endeavors at highly regarded universities throughout the country, supported by Don Diego Scholarship Foundation scholarships ranging from $1,000 to $10,000. 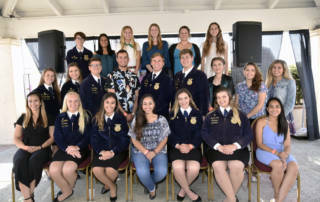 In 2018, the Foundation awarded a record $72,500 in college scholarships to students who participated in the San Diego County Fair and/or other activities associated with the Del Mar Fairgrounds. Olivia Jarvis arrived at the University of Hawaii in Hilo in August eager to begin her Marine Science studies — only to be greeted by Hurricane Lane. 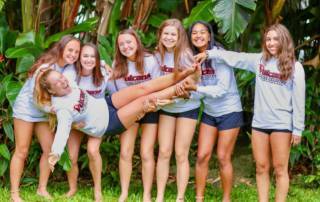 Buoyant despite days of non-stop rain, delayed classes and confinement to her dorm, Olivia has joined the cross country team and is ready to have a “Hilo” of a great experience at college. Top $10,000 Scholar Gigi Manasan was equally undeterred from pursuing her Math major at Creighton University in Nebraska despite being sidelined in the hospital for the first few days by a health issue. Having dealt with serious chronic conditions throughout her young life, Gigi is moving forward with her usual aplomb, including fulfilling the Crieighton tradition of touching Billy the Bluejay’s beak. Cal Poly San Luis Obispo, where many Don Diego scholarship recipients have matriculated, welcomes Hailey Baldwin, Tori Pedersen and Megan Clodfelter. Sister school Cal Poly Pomona is the happy home for Elizabeth Melott and Hiram Olivarria. Some 2018 Scholars are attending local schools such as Miramar Community College, Palomar College, San Diego State and San Bernardino State. Others are venturing to UC campuses and farther afield. Your Free Days at the Races Start Here! Del Mar, CA… Your best bet for a winning season at the Del Mar Thoroughbred Club horse races starts with a Don Diego Amigo Club membership. For just $99 ($150 for two memberships), the Amigo Club provides free admission to every day of the summer (opening day: July 18th) and fall racemeets, every day of the 2019 San Diego County Fair plus four single-day passes to Surfside Raceplace and one single admission to The Scream Zone and Pelly’s Miniature Golf. 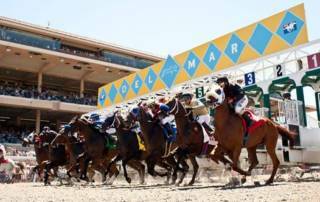 The world-famous Del Mar track www.dmtc.com has showcased iconic horses such as Zenyatta and California Chrome. On certain racedays, it rocks out as a destination venue for free concerts and other entertainment attractions included with admission. Visitors entering the gates can discover the Don Diego Fountain sporting hundreds of Legacy Bricks commemorating winning bets at the track, memorable moments at the Fair, and fun family times at the Fairgrounds. These customized bricks can be purchased on the Don Diego website for $150. Del Mar, CA… Thirty minutes before the gates to the San Diego County Fair open to the public on Plant*Grow*Eat (PGE) days, busloads of fresh produce-laden elementary students hop eagerly onto the infield Farm where enthusiastic volunteers judge their lovingly grown-from-seed lettuce, tomatoes, radishes, nasturtiums, beets and other edibles. Not every young farmer wins first place, but everyone receives a ribbon, warm accolades for their achievement and a hearty smile from the judges before they set off to pet animals, learn more about agriculture and nutrition from the ground up and, for some children, enjoy their first glimpse of the ocean. Waiting to greet students on June 22, 2018 were people from organizations who sponsored buses from San Diego area Title I schools through Don Diego Scholarship Foundation’s PGE Bus Transportation Program. The program funds buses for schools that could otherwise not afford to transport students to the Fair. Some sponsors, such as Teresa Palzkill, Immediate Past President of Les Dames de Escoffier, served as judges. Others were on-site to enjoy the fruits of their donations as seen in the eyes of happy children proud of their crops.